I just acquired a T30 a few weeks ago (someone gave it to me). It was overloaded with a vast amount of useless softwares, after a fresh install of XP, it went better. I got impressed about how it runs smooth with XP, I initially planned to use it as an offline pc for car diags mainly but I decided to use it as a "main laptop" for my trips. A part from a (nearly) dead CMOS battery, a dead DVD driver and a bad estheitic shape (worn cover) the beast seems ok (not too much fan activity). It seems like it's been upgraded in the past, it has a 80gb hdd (dunno the speed yet), 1gb of ram and a sticker from a PC repair company. I plan to upgrade the old guy a bit, I already went through this forum and gathered some info already. I already ordered a Mini PCI Wifi Card (yep I know about the No1082 hack), for now I use a USB Wifi dongle on the 1.1, works ok but that's not very convenient. I'd want to upgrade the ram but I'm not sure about what I read here: is the limit 1g or 2g ? How about a CPU upgrade ? I read on an old post that it would be possible to upgrade for a better P4M, is it true ? Last but not least, I need 2.0 USB, soooo ... PCMCIA ? Which one should I use ? Which size ? For PCMCIA with external power supply, where could/should I wire the cars from "inside" the laptop ? Max ram is 2gb. PC2100, PC3200, or PC2700 ram will work, but all will default to PC2100 speeds. You can upgrade the processor up to a 2.6Ghz P4M SL6WZ cpu. 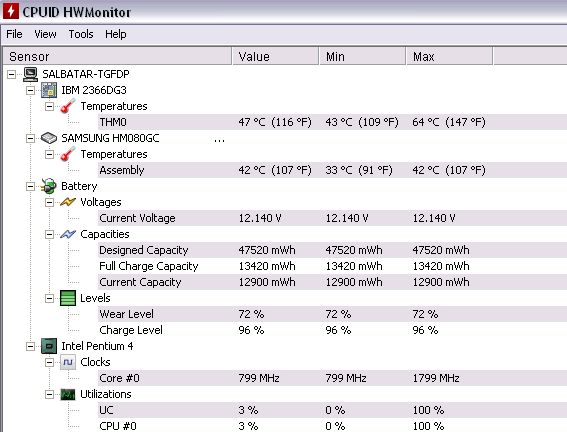 However, I wouldn't go past 2.0Ghz (even with the upgraded heatsink) because your laptop will turn into a blowtorch . Even if you use the fastest processor, these are still pentium 4 chips which are far slower than the later pentium m found in the T4* models. Running modern apps or browsing the internet will still be slow. Additionally, check the ram slots on the laptop by swapping the ram sticks into each slot. T30 and A31 models are known to have loose soldering on ram slots. brchan wrote: Max ram is 2gb. PC2100, PC3200, or PC2700 ram will work, but all will default to PC2100 speeds. Ok nice, yep I knew about the 2100 capped MB. Good to know for the 2gb. I'm gonna have to "dig" in my cardboards to find some ram. brchan wrote: Additionally, check the ram slots on the laptop by swapping the ram sticks into each slot. T30 and A31 models are known to have loose soldering on ram slots. Yep I saw the thread about this, I think I'll do the ram swap with computer hot to "ease" the process (hopefully ?). Just for my personnal purpose, does this ram pins soldering issue comes from "playing" with a ram slot or does it break randomly/because of shocks/vibrations, etc? brchan wrote: Even if you use the fastest processor, these are still pentium 4 chips which are far slower than the later pentium m found in the T4* models. Running modern apps or browsing the internet will still be slow. I don't use it for other stuff than browsing internet, sometimes low def YouTube videos aswell and running some car diagnostic softwares so it's already enough for me. For other stuff I have my job's laptop and my PC at home so the T30 is only here for beeing tough, nice looking and an enhanced platform for browsing internet (rather than my smartphone) when away from home. I just plan to gain the little more I can gain without breaking my wallet. Seems fine to me (if it's accurate). I used it for like 1.5 hours while HWMonitor was open, so Min/Max should be fine. - How is the power supply for an USB one ? Am I going to be using a limited amount of intensity unless I plug an external wire from a "classic" 1.1 USB ? - What are the specs of the PCMCIA USB Cardbus should I be aiming for ? (I'm not searching for a link, but more for "keywords", a part from "USB 2.0" ). I'll try to clean up my T30 in order to post a nice picture of it. Just to be sure : with this type of card, I have to plug a power cable "if I want so" ? As long as my power consumption remains under 100mA/~1W per port, obviously. No adapter needed as long as you use no more than 500mA per port. I just have to say, Windows XP in Classic mode with ineXPerience and K-Meleon for a Web browser does wonders for these older machines! K-Meleon 76 Beta 3 is the latest (mostly) stable version. Good luck with your new ThinkPad! Thanks for the links, I didn't know IneXPerience, that's interesting. Quick update on this old guy, still doing its job, browsing forums, car diags and stuff, it's been travelling with me all around the country. The Toshiba couldn't endure a week of what the T30's been doing for almost 2 years : the mainboard broke (it somehow cracked I think, some solders blew on GPU). Just on a side note, since 6 months it's doing some kind of a "meep" while running every once in a while. Like not a concrete "beep" like if I was plugging the adapter or when it's booting, but just a shy "meep", even when it's sitting doing nothing on desktop ... Never figured what could cause that but so far it seems to be ok. If the SSD from the Toshiba is a PATA drive, I would move it into the T30. Alternatively, get a mSATA SSD and a mSATA to PATA adapter. I have this setup in my T23. The SSD will increase the performance and decrease battery drain. And the SSD will be cooler inside than the spinning HD, so less heat for the computer to get rid of. And unlike a spinning HD, the SSD is immune to shock when running, cuz no moving parts. It is hard to give up on an old Thinkpad. I want to keep it going, way past its prime. Interesting, have you bench'd this setup to figure what was the rate writing/reading ? I've been searching with a zooming thing (can't recall how its called) for any broken solder or so, couldn't find any defect. I'll try with a soft kind of wedge then, thanks. I'll have to dig in my stocks to check out if I have some 1g laying around then. I got this, it worked ! Thanks for the advice ! I used some kind of spongy foam made for high temperatures (like very hot water pipes in hospitals or so), cutted in a small slice, it went like a glove ! Trust me we all know those hiccups about the ThinkPads around that era. I am dealing with A30p which is prone to GPU desoldering and I can't do #1 and #3 above because I carry it around my house for speakers and always run it on battery. I already saw A30 motherboard with GPU defects and A31p motherboard with capacitor or southbridge failure so I am pretty scared of it. My solution is to take a thermal sponge from that A31p and tuck it in between the heatsink and the GPU die hopefully it absorbs most of the heat and reduce the chance of that failure. At least I am positive of the GPU temperature being lowered because I no longer feel the heat if I touch the top portion of the base. Even after 720p movie playback it is not hot but only warm to the touch. Well same here, unfortunately it has to move. A lot. I'm being easy on it tho, I'll try to do even smoother "landings" to prevent the other slot from fail. Feels bad about your A30p. That's somehow even worse than my case. Hopefully your "trick" will work, fingers crossed for you. Hmm good luck with your T30 then! A little correction: you don't have to be sad for mine, my A30p motherboard is flawless, it's just I saw a dead A30 and A31p motherboard so I'm scared of it taking place in my motherboard, therefore I put some thermal sponge to absorb the heat into the heatsink and keep problems away hopefully.